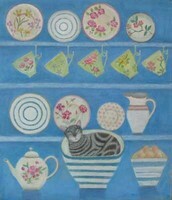 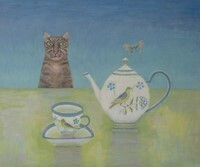 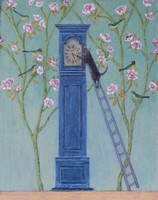 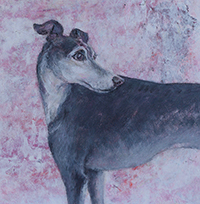 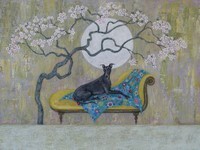 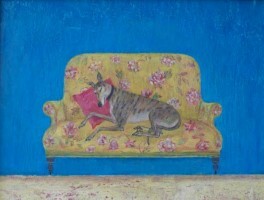 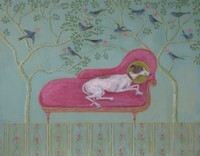 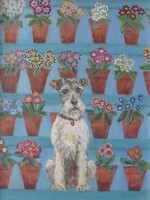 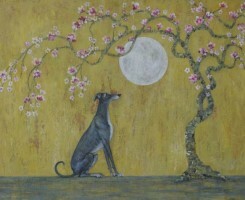 In my paintings I try to capture the amusing characteristics of cats and dogs. 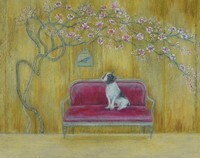 I often paint quizzical Pugs, languorous Greyhounds, and naughty Terriers. 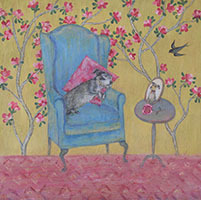 I enjoy their simultaneously funny and sad expressions and place them in domestic situations, where guilty looking dogs sit on forbidden sofas, wait eagerly for the drama that the Postman brings and dream of sunny excursions in bicycle baskets and beautiful cats with tiny Tiger attitudes, laze blissfully on rugs by the fire, hunt butterflies that alight on old china tea cups, and are captivated by tantalising birds singing from blossoming trees. 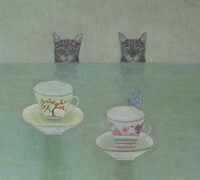 My studio is a shed in my Cornish garden where my two cats roam. 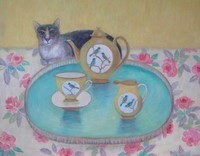 The garden birds and wildlife, and its changing floral landscape, give me many ideas for paintings and collected curios, china and textiles also give me inspiration. 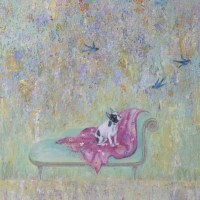 I paint in acrylics on board, and like to create dreamy, nostalgic, colourful scenes. 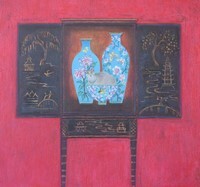 I live in Cornwall, with my artist husband Michael Rees.